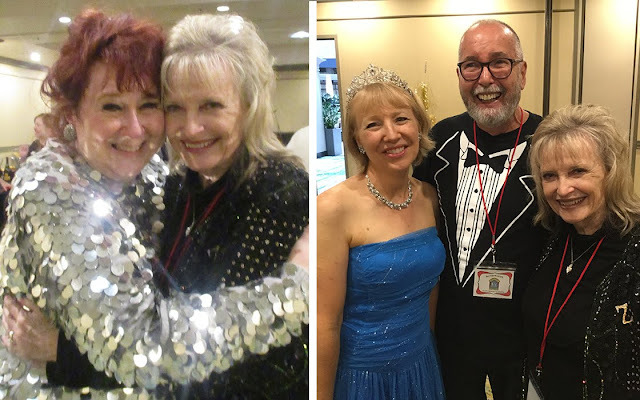 The 2018 National Paper Doll Convention that took place in the gorgeous Northwest will long be remembered as an especially entertaining convention thanks to hosts Sharry O’Hare and Micheal O’Hara and their super support teams, especially the fun-loving members of the local club. I’m sure to think back years from now and say to myself, “Ah yes, I remember”… Eternally lovely Norma Lu Meehan’s heartwarming surprise at receiving the Fanny Gray Award created for her by Jim Howard. I will remember sitting next to delightful Karolyn Grimes at dinner, chatting about her famous line in It’s a Wonderful Life. 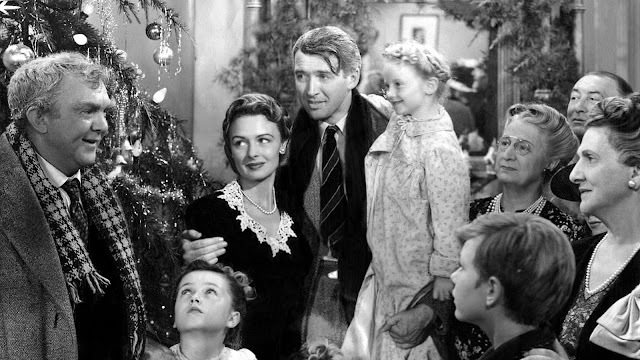 (In case you can’t recall, as Zuzu Bailey in James Stewart’s arms, she chirped, “Every time a bell rings, an angel gets his wings.” I will remember being dazzled by Jenny’s princess outfit topped with a sparkling tiara. I will also remember the towering table centerpieces, a veritable shower of stars. I will remember sweet Susan Fisher’s fabulous turquoise hair. 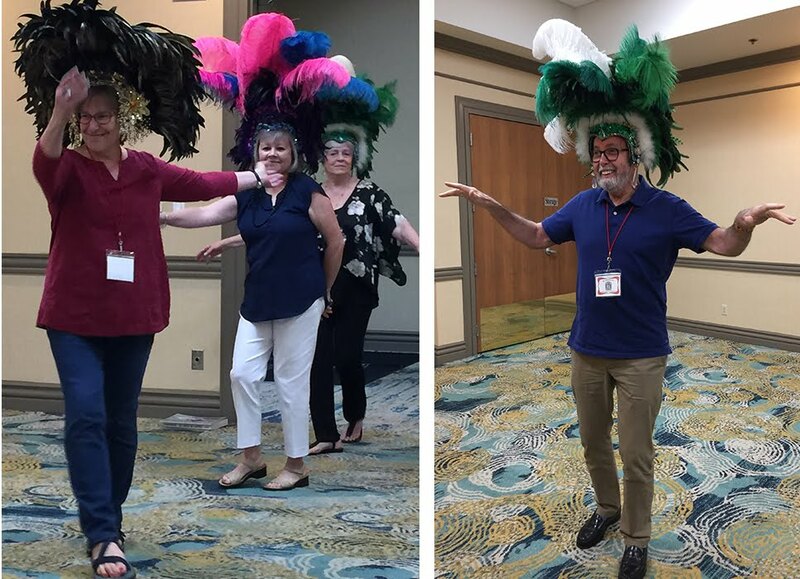 I will remember actually wearing a Follies feathered headdress, a once in a lifetime feeling that I had “stepped out of a dream.” I will remember how glamorous all the ladies looked for Saturday night’s Oscar dinner, dressed to dazzle… and did they ever! I will remember the theatricality seamlessly organized and presented by Sharry and Micheal… especially being backstage at the historic Pantages theatre. But most of all, when I think back, I will remember the highly emotional pleasure Sharry got by turning a convention into a maaarvellous party! Child star Karolyn Grimes with our convention host Sharry O'Hara, and right with "princess" Jenny Taliadoros and myself. Karolyn Grimes in her infamous role of Zuzu Bailey in the Christmas classic, It's a Wonderful Life. We stepped out of a dream! Sharry enlisted the help of her Seattle paper doll club to show off the beautiful headdresses from the Tacoma Musical Playhouse. And I got to wear one, too! Left: all dressed up for our celebration of the Oscars. Tacoma Musical Playhouse Director Jon Douglas Rake with the O'Haras. Left: Melissa Smith points out her pretty gown for the Angela Lansbury dress-a-doll. Right Susan Fisher and her fabulous turquoise hair with Fran Myers, showing off ribbons from Competition. Of course, happy memories abound, but even better reminders of a good time are the souvenir paper doll books and there were more than ever. More than 10, in fact, plus menus, plus plus! Attendees were agog with delight and the absentees are in for a big treat when they receive their souvenirs, created especially for the Entertainment Extravaganza theme. Souvenirs and more souvenirs and more souvenirs! 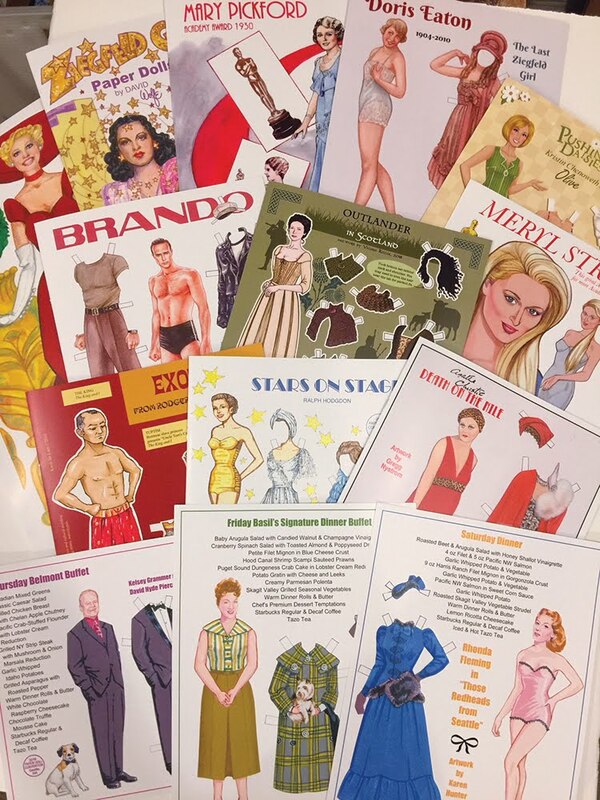 Conventioneers were given sheets of black-and-white artist-created-and-donated paper dolls in their goody bags. It’s doubtful that any attendees had a spare moment to color and cut, not with all the presentations, workshops and entertainment, not to mention lavish meals and those chocolate dipped strawberries every afternoon. So that means hours and hours of fun back at home, coloring and cutting. Here are some sheets colored by me. Such fun! Mary Tyler Moore doll concept by Rudy Miller and Mae Murray by Sandra Vanderpool. Hidden Figures” by Julie Allen Matthews and Irene Castle by Brenda Sneathen Mattox. 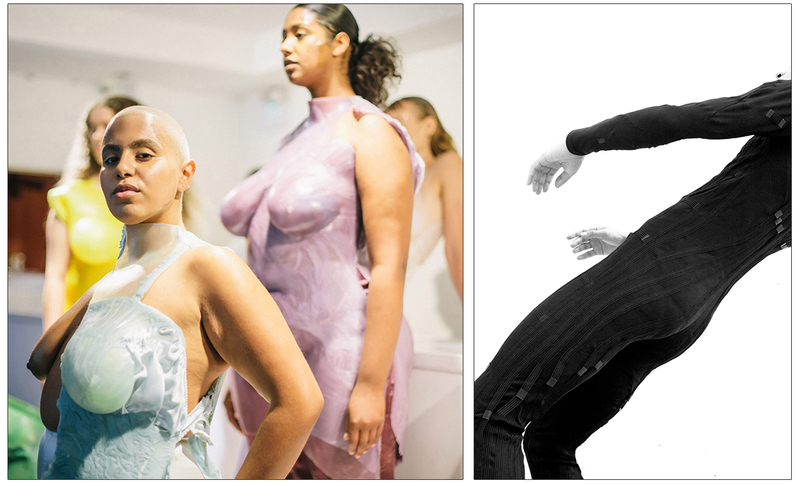 London’s Royal College of Art represents the very vanguard of fashion research and the 2018 graduates of the fashion masters courses exemplify out-of-the-box expressions. Zowie Broach, Head of Fashion articulates the college’s mission statement, thus. “A unique position at the junction between the creative arts, design and science, posing answers to questions about fashion identity and our future selves.” The grad show was entitled “A Walk Without a Cat” and offered oblique points of view that reveal how today’s young talents are redefining the traditional role of fashion designers. RCA’s grads worked within three guidelines: 1…Material Development, 2…Fashion Systems, 3…Digital Transformation. Here are the thoughts articulated by some of the cutting edge creators now about to shake away the past. SINEAD O’DWYER molded torsos of silicone and fiberglass then covered them in lovely-colored silk. 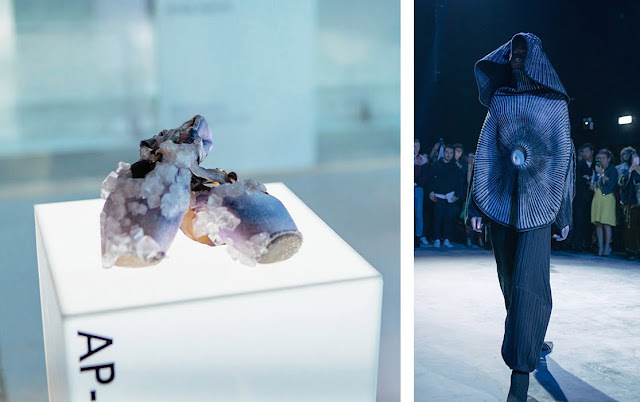 ALICE POTTS encrusted garments and accessories with beautiful crystals grown of human sweat. ANNA TALVI looked to the future with a collection to wear in space and microgravity environments where bone loss and muscle atrophy are challenges. MARIE LUEDER calls her leather, denim and rubber menswear collection “heteronormative.” RENATA BRENHA RIBEIRO mixed food with textiles and adds chili peppers to her Latin-inspired collection. YUAN-LUNG KAO designed loose knitwear centered around a circle. Will any of these ground-breaking fashion thinkers become household names in the future or will their creativity be thwarted by the formidable commerciality of Rag Trade reality? Marie Lueder and Alice Potts 17.18…Yuan-Lung Kao and Renata Brenha Ribeiro. Anna Talvi and Sinead O’Dwyer. Sometimes a significant fashion statement comes as a surprise, originating outside the usual stylesphere. I’ve been a fan of Iceland’s eccentric Pop Princess ever since she wore that bizarre swan costume at the Oscars years ago. She’s on tour right now and as always she is like no other. The theme of the presentation is a visualization of a society that balances the natural with man-made. Only Bjork would come up with a giant orchid as a set that recalls paintings of her childhood. Ditto her costume, a romanticized dress that goes perfectly with the mask she commissioned, requesting that it make her face look like “a mutant bird-plant.” She is accompanied by a 12-piece flute ensemble costumed as if wearing flowers and bones. More Bjork news: The Gucci Garden Museum in Florence opened recently with an inaugural exhibition of Bjork’s gowns and masks from her last music video, “The Gate.” The two gowns on display were designed by Gucci Creative Director, Alessandro Michele and the masks were created by James Merry. Bjork’s latest vision, a magical Utopia. Flute ensemble and trend-setting star, Bjork. Bjork display at the new Gucci Garden Museum. The runway was more important than the clothes at two of the most important spring ’19 menswear shows. 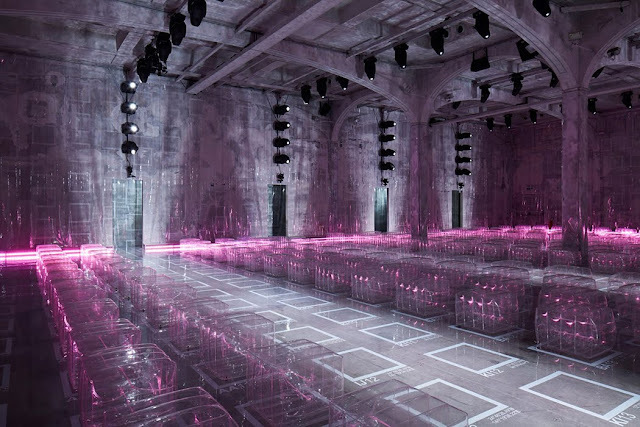 Prada’s show was presented in their own vast double-vaulted space in Milan. It was stripped-back to raw and rugged concrete and then completely covered with translucent sheeting on the walls and floor. The sheeting was printed with a blueprinted grid-guide leading to five runways and seating on inflatable footstools first produced in 1960 by Danish designer Verner Panton. (Coincidentally, Dries Van Noten’s show this season featured Panton’s color palette and one of his undulating stripe prints.) The Prada show is always way, way out there and the avant garde setting needed an explanation. It was said to be “the mathematical approximation of geographic representation.” Pretentious? You betcha. 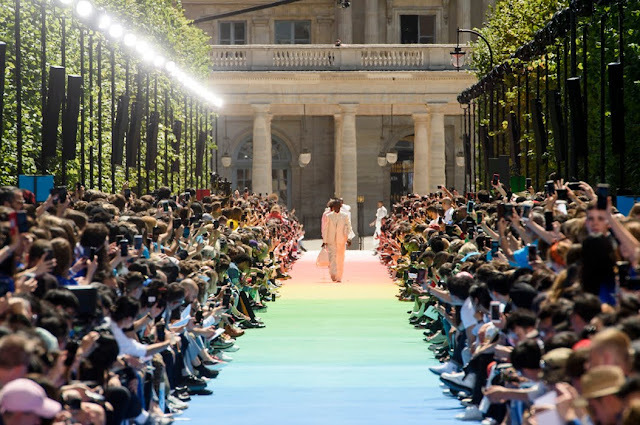 In Paris, the Louis Vuitton show, held in the lovely gardens of the Palais Royale, was easier to comprehend. The 200 meter long runway was gradient painted to resemble a rainbow. Some said it was in support of the LGBT flag, but it was also a nice tie-in to a few prints inspired by “The Wizard of Oz.” The show marked the debut of Virgil Abloh, a very hot name right now, but inexperienced. The clothes were OK. Just OK.
Prada’s avant garde show installation, a translucent grid-guide. Louis Vuitton’s rainbow runway in the gardens of the Palais Royale.